Definition at line 24 of file chainiksolvervel_pinv_givens.hpp. Definition at line 27 of file chainiksolvervel_pinv_givens.cpp. Definition at line 67 of file chainiksolvervel_pinv_givens.cpp. 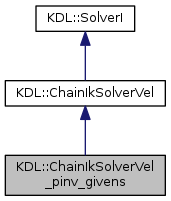 Definition at line 72 of file chainiksolvervel_pinv_givens.cpp. Definition at line 47 of file chainiksolvervel_pinv_givens.hpp. Definition at line 49 of file chainiksolvervel_pinv_givens.cpp. Definition at line 59 of file chainiksolvervel_pinv_givens.hpp. Definition at line 53 of file chainiksolvervel_pinv_givens.hpp. Definition at line 56 of file chainiksolvervel_pinv_givens.hpp. Definition at line 55 of file chainiksolvervel_pinv_givens.hpp. Definition at line 58 of file chainiksolvervel_pinv_givens.hpp. Definition at line 54 of file chainiksolvervel_pinv_givens.hpp. Definition at line 60 of file chainiksolvervel_pinv_givens.hpp. Definition at line 57 of file chainiksolvervel_pinv_givens.hpp.